the first 40 years, at the book launch Wednesday. And now here's your chance to get your hands on the whole scoop! Douglas College: the first 40 years is fresh off the press and becomes available Wednesday, Feb. 9 at 4pm during an exclusive book launch in the foyer of the Laura C. Muir Performing Arts Theatre, New Westminster Campus. 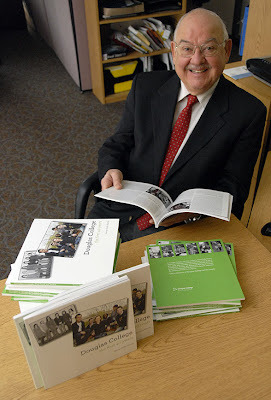 Meet the author, Gerry Della Mattia, retired Douglas College administrator, and have him sign your copy. A few books will be given away, so don't miss it! The book is $20 - HST's included if you purchase on launch day. If you can't make the launch, Douglas College: the first 40 years will be available in the Douglas College Bookstore beginning Feb. 10. In Douglas College: the first 40 years, Gerry Della Mattia details the activities, events and crises of one of BC’s major post-secondary educational institutions since its creation four decades ago. Along with first-hand accounts by students and employees, he honours the past, celebrates the present and looks to the future.